Some time ago, after dropping off TDJ stocks at Kissjane Citylink, we spotted no queue at Sushi Express and decided to give it a try $1.50 per plate, so why not? Especially when its for a Friday dinner date in town. For $1.50 per plate, it is pretty reasonable for me! And that's pretty much what we had since the boy wasn't very hungry. The total bill worked out to $20ish, and there's no GST and service charge if I'm not wrong. Started off the 初五 morning with some exercises and whipped up a quick fix for lunch earlier on. Mee sua with pork, prawns, enoki mushrooms in abalone broth. It's so delicious I thought I was in heaven and it is supremely easy to cook, all under 10 mins! Step 3: Boil a pot of water to cook the mee sua quickly. I don't like mine too soft and like it to retain abit of its saltiness. Dish up the mee sua and set aside. Step 4: Bring to boil the abalone broth with abit of water and add in pork and prawns until they are cooked. Step5: Pour the broth over the mee sua and you are ready to feed your tummy! I forgot about the enoki mushrooms till the last step and just burried them under the mee sua and soup. And they cook real fast! I'm loving this so much I'm craving for one more bowl right now! Writing this post before preparing for the reunion dinner on 除夕。Finally the festive season to justify your sinful eats has arrived, with the perfect reason for every gathering! It's no joke baking thousands of these little ones. And yes, I pretty much burnt my valentine's day with the boy churning out these golden balls. I guess this would be one of the most memorable valentine's day! (: We killed 2 entire Saturdays for pineapple tarts making (incl valentine's), with the poor boy having no sleep at all and jetting off to a week of business trip soon after. The poor boy told me he was so sleepy he fell asleep twice while packing in the tarts into the bottles. 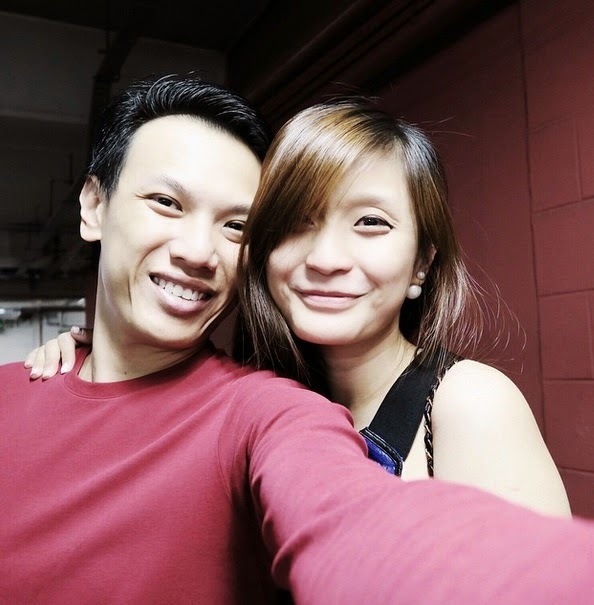 Managed to sneak out for a quick dinner for Valentine's day as I had to drop off TDJ stocks at Kissjane Cityhall. Else Valentine's day dinner would just have been at the coffeeshop downstairs. 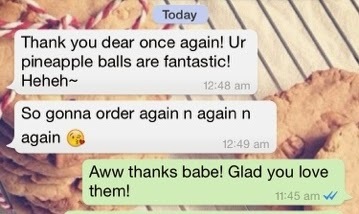 Our customer J who loves our pineapple tarts so much. Thanks sweet J, your love for it really keeps us going. Honestly selling of pineapple tarts is absolutely not lucrative, with the mass amount of time and effort needed for that little bit of income, I could well just focus on TDJ. And J's reaction when I told her the bf contemplated not to sell next year, but well I convinced him to do so, except that we have to cut off orders earlier and make proper planning for the order taking! But it seems all worth it when our customers love them, with one of my brother's colleagues ordering 8 bottles at one shot after trying them. Thanks for loving our golden treats! What else did you get for your CNY festive goodies stash? I'm off to prepare dinner!